You’ve done a few outreach campaigns and gotten some good responses. But are you happy with getting 10 or 20 responses after sending 100 emails? That just seems low if you’ve targeted relevant people. 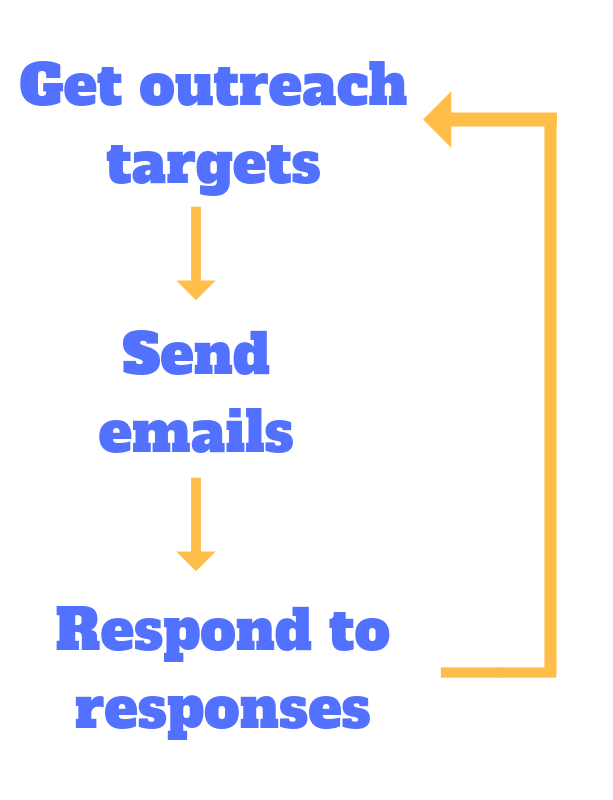 In my experience, you can get that number up to 30 to 40 responses per 100 emails if you really maximize the effectiveness your outreach process. The benefit of getting those extra responses is that you get more backlinks (or whatever you’re after) for the same amount of time. Realistically, you can double or triple your effective hourly rate by optimizing your process. So what I’ve written about here, are 4 ways that can take you from decent results to really strong results. All the best salespeople and link builders use a process. A process is a repeatable procedure you can follow to produce a consistent high quality result. The reason that processes are so important, is because it removes all the guesswork. Once you figure out the best way to create an email outreach template once, you can create a process for it. Then, instead of starting from scratch the next time you need a template, you just follow your process. If you hire people in the future to help with your outreach, you just hand them your process breakdown, and training is basically done if your process is good. Within each step, you’ll have a more specific process. Scrape Google results for list of advanced operators (add a link to the list). Go through each URL and see if it’s a good target. Find contact details for each good URL. If you were handing this process off to someone you hire, you’d go into even more detail, maybe even record a short video for each step. Now with a process, instead of wasting time thinking about what you need to do for your outreach campaign, you just follow your list. You’ll be more productive, and get more consistent results, because you won’t forget any key steps. That’s a fundamental rule of conversion rate optimization, which is essentially what we’re doing here. Number of results (links, sales, etc.). But since we’re specifically looking at response rate here, I’d recommend going deeper. I’d also recommend tracking the template used, number of email opens, number of unique email opens, and number of link clicks (if applicable). To track all these things, use a simple plugin like Yesware. 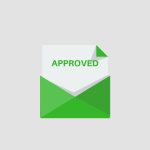 It will let you track your emails, so you see who opens an email, when they do it, and if they interact with any links. The whole point of recording data from your campaigns is so that you can try out different tactics and see which ones work best. Then, you apply the lessons from the best variations to your outreach process, and keep optimizing your response rate until it’s maximized. Split testing involves testing 2 versions of a test, with a single variable changed. This allows you to compare them and determine which version of that variable is better. For example, you could split test 2 different greetings. For half your emails in a campaign, you’d start them with “Hey [name]”, and for the other half “Good morning [name]”. You might find that the first one gets 5% more responses, and declare it the winner. You do this over and over, each time improving your results by anywhere from a few percent to something 10-20%. It adds up over time. If you use a tool for outreach, it likely has split testing functionality built in already. Within each variable there may be several that you’d like to test. Since you can only do one variable at a time to make sure that it’s having the impact, it takes time to optimize a process. Note about sample size: You need a big enough sample size for your conclusion that one variation is better than another to be valid. Typically in statistics, you want to aim for 95% confidence, which means that 19 times out of 20, you made the right conclusion. You can calculate this yourself using a free split testing calculator. 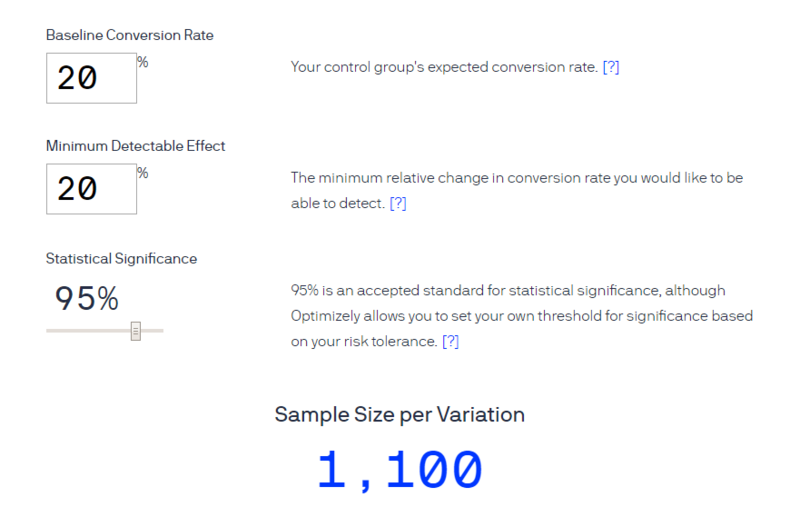 Optimizely has a good one that will tell you how big your sample size needs to be. You’ll typically need at least a few hundred, so this only really works on larger outreach campaigns. Any salesperson will tell you that warm leads convert better than cold ones. Basically, if your target knows you, they’ll be more receptive to considering your request. Think of when you email friends and family, you get close to a 100% response rate because they’re really “warm” to you. There’s a trade-off between time invested in building a relationship with a lead and results. The right amount depends on the specific campaign. In my experience, it helps a decent amount to do something small and quick so that your target at least recognizes your name. Joining their email list and replying to one of their emails (not trying to get links here). Sharing their content on social media and tagging them. Following them on their preferred social media platform and engaging with their posts. Commenting on their blog posts. Any of these things take maybe 5-10 minutes in total and can be done a few days to a week before your actual link request. Most of these steps are an ongoing process that will take some time upfront to set up. However, let’s do some quick math to see how important all this is. Let’s say each response hypothetically equates to $20 of value to your business ultimately (from links or sales). For a typical outreach campaign, you might spend 10-20 hours doing outreach. That bit of extra work that resulted in improving your response rate from 20 to 30% (and that’s pretty conservative) effectively results in $200-400 extra of value per campaign. Multiply that by many campaigns and it’s clear how much a few extra responses matter. If you’re not willing to do this, then you should probably hire someone or a some service who is willing to, or has an optimized process already.